Cilantro or Coriander (Coriandrum sativum) is the herb of the year for 2017 as announced by the International Herb Association. It isn’t a rule, however, I’ve found that generally in recipes coriander refers to the round seed and cilantro refers to the fresh leaves; but they are used interchangeably. This is a delightful and unique flavour that has been found to be the most widely used culinary herb around the world. I use those fresh citrusy leaves in guacamole, salsa, and many of my other mexican dishes are garnished with a dollup of sour cream and a pouf of coriander leaves. They make an East Indian Dahl soup taste just right, and the Lebanese Foul M’Dammas wouldn’t be the same without it. Most Lebanese dishes employ the liberal use of both the ground coriander seeds and the leaves even if just as a garnish. When I got a falafel recipe from my late friend Sam Haddad (who ran several amazing Lebanese eateries in his day) I discovered the secret to the best falafel I ever had! It was made from about 80% FRESH coriander and parsley. Cilantro is used in Chinese stir-fries and fried rice recipes and may be called “Chinese parsley” at the Asian produce shops. It’s often paired with lemongrass in various Thai salads and grilled dishes. Among the Vietnamese, Cilantro is called Ngo and used widely in Pho, savoury crepes and other noodle or rice dishes. For over 5,000 years, Ayurvedic medicine has used both coriander and cilantro to support liver function, fight bacterial infections, encourage digestive enzymes, detox the liver and kidneys, incite memory, soothe skin rashes, and to stimulate the secretion of insulin. It boasts an extraordinary 32% of the recommended daily intake of vitamin K and is also high in vitamins A, C, and E as well as several minerals which would be more concentrated in the seeds. The herb has gained wide popularity recently for it’s proven capacity to aid the body in ridding itself of heavy metals like arsenic, cadmium, aluminum, lead and mercury. Another interesting thing to note is that the aversion to the flavour of coriander some people have has been found to be genetic! A study by genetic testing firm “23andMe” found people who describe coriander as tasting too soapy all shared a particular gene called OR6A2. It has to do with the SMELL of those particular aldehyde molecules found in coriander. 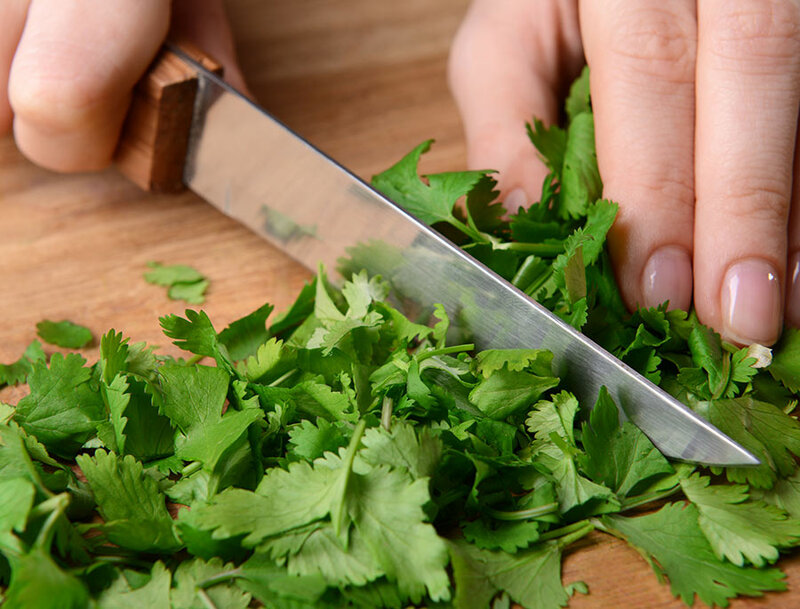 According to 23andMe: ‘We put the cilantro (coriander) taste question to about 50,000 23andMe customers asking whether they liked the taste of cilantro and whether they thought cilantro had a soapy taste. When we compared the DNA of the cilantro haters to the DNA of the cilantro lovers, we found a SNP, or genetic variation, called rs72921001 to be associated with the trait in a subset of about 25,000 people with European ancestry. So you can blame your Ancestors next time you have to ask the chef to skip that one! But I hope you don’t have that gene because the food which dances with cilantro has a global appeal all the most exotic and colourful foods out there include it!